When we travel, we often know our destination. We know what to expect from point A to point B, and aside from the occasional traffic jam or detour we may not give the actual journey much thought. If you are like me, you fill the cabin with the latest SwitchRPG podcast, or serenade the steering wheel with a tone-deaf hit from your playlist. Rarely do we travel to find answers, or to simply see where a path might take us. In God Wars, however, the path is full of questions and a party seeking their answers. In God Wars, you take a blind path to find truths, loved ones, and to escape those whose agendas would have you imprisoned rather than remaining free. Kaguya is a princess who is next in line to be sacrificed to the Gods of Mount Fuji. This practice is being used to calm the Gods and prevent a cataclysmic eruption. However, there must be answers as to why the Gods are so quick to rage. Kaguya is rescued from her fate and sets forth to find answers from her long-lost mother. You meet various characters along the way who will join you in the quest, each possessing a unique skill set to be used and mastered. Combat takes place on a traditional tactical map with the number of members varying each battle. Job classes will be grouped into the typical front, mid, and back row fighting classes. 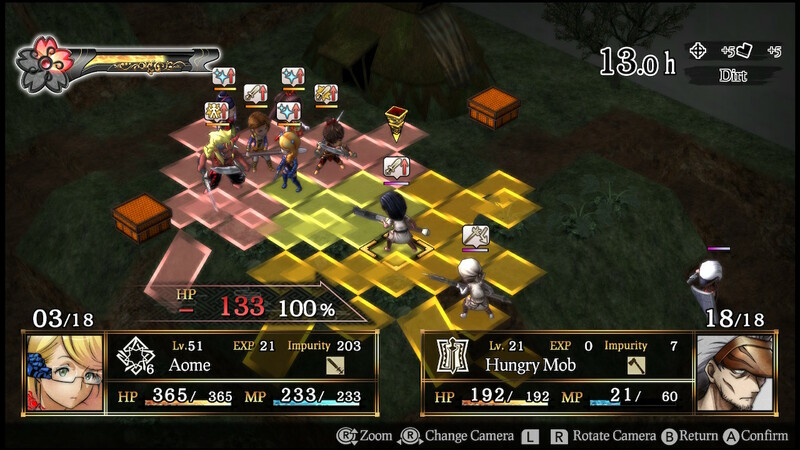 However, in addition to each character possessing two classification slots, their unique skill set adds depth to their combat builds. While you will not have the same level of customization as found in Final Fantasy Tactics, the amount of individual classes more than make up for it, in my opinion. God Wars provides basic difficulty selections, which can be changed at any time provided you are out of battle. If you are in the mood to simply progress the story you can dial the difficulty back a bit, and can always revert it should you want to make it more challenging again. At the start of the battle, the map will rotate around your enemies and you will be able to place a set number of characters for the skirmish. Team composition and enemy placement are important, as factors like higher ground and unit makeup can impact combat greatly. While you do start the battle with full HP, your MP will charge per turn, resulting in your characters being without their more powerful attacks. One part of combat I enjoyed the most was the number of skills you could use. Each class comes with a full set of abilities so you will not feel like you have to compromise with your play style. Throughout the battle you will have a meter that charges with combat actions and, when charged, characters will be able to perform secret skills. These skills, when leveled up, can wreak havoc on the enemy and feature some of the best animations in the game. Unfortunately, these animations are victim of essentially being copy-pasted across multiple skills within individual trees. My final criticism in regards to combat is the time investment they require. With fast movement on, battles can push the 1-hour mark, which in my opinion is just a little too long. Excess units seem to be used to prolong battles, and many times the main boss or final units will not even move until you’re in their general area, which could be as late as round 20. Regardless, I found the combat system quite satisfying overall. During your travels, some cities will harbor shrines and shops. Shrines give an opportunity to donate cash in order to buff you for the next battle. Much like eating a meal in Monster Hunter, it is a good practice. Each donation provides a combat buff and also goes towards leveling up the shrines themselves. In place of random battles in other games, shrines have “combat requests” which provide an opportunity to fight optional battles and score rare loot. God Wars is an extremely polished game. I did not experience any technical issues and loading times are a non-issue. The characters are unique and have their own personalities and accompanying voice acting. While the artwork is clearly anime inspired, the cutscenes switch to a live-action manga style. The number of cutscenes in the game help progress the storyline while breaking up your standard text box conversations. Menus are easy to navigate on the world map, but the combat menus can become a little too cluttered mid to late game. The music is really nice, with my personal favorite being the battle ballads. I had flashbacks of playing Final Fantasy Tactics while taking on my foes with the heavy drumlines. The world map music reminded me of a more medieval melody, but it was a good listen nonetheless, especially while assigning job points to your classes (which can take up a lot of time). I enjoyed God Wars a great deal. The story itself does not have the greatest depth, and I would only classify it as your typical RPG storyline, but it does what it sets out to do well. Pairing this with great gameplay mechanics and solid systems and you have a well-made RPG. While I personally would have liked to have seen more resources put into the battle aesthetics and a few more plot twists, the details embedded in each of the characters you meet helped me overlook it. 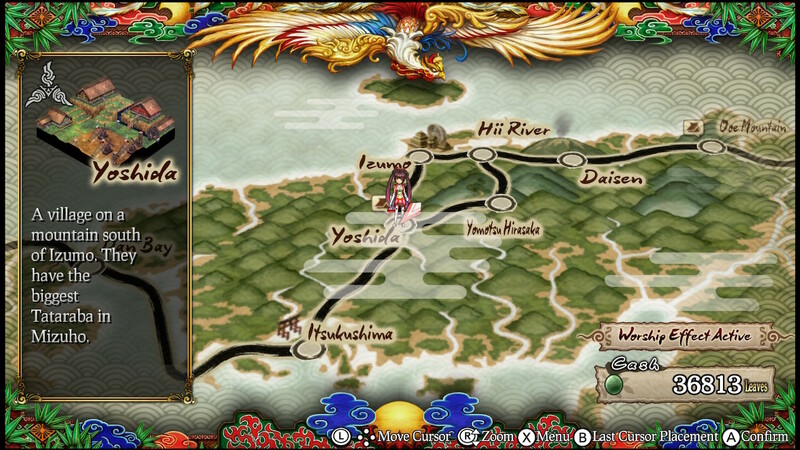 If you are looking for a well-made tactical RPG with manga-style storytelling, I would recommend God Wars. I’m willing to try almost any tactical RPG that is in a similar vein as FFT, so I will be keeping an eye out on this one for sure.